Watch Obama discuss the Iranian president's visit Monday. 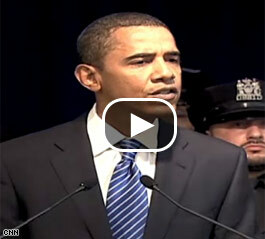 NEW YORK (CNN) - Sen. Barack Obama stood his ground Monday on his controversial remarks earlier this year that he would meet with Iran President Mahmoud Ahmadinejad. "We should never negotiate out of fear but we should never fear to negotiate," Obama said, quoting John F. Kennedy. "Meeting with somebody is not tantamount to agreeing with them," he later added when taking questions from reporters after announcing an endorsement by the New York City Correctional Officers Benevolent Association in Manhattan. Obama's toughest Democratic primary competition in the race for the White House, Sen. Hillary Clinton, criticized Obama earlier this year for saying he would meet with Ahmadinejad during a debate, called his comments irresponsible and attacked the Illinois senator for being inexperienced. Obama also said he would not have invited Ahmadinejad to speak as Columbia University has done. Ahmadinejad, who is in New York City to visit the United Nations, was invited to speak Monday afternoon at the university. But Obama said U.S. schools have the freedom to make such decisions. The NYC-COBA, the largest municipal prison union in the United States, represents 9,000 correction workers in the city. Talking doesnot mean that one will endorse or accept oter viewpoints. todays enemy could be tomorrow best friend. Didn't US changed policy towards a country that attaked Pearl Harbor and killed over 3000. May be we are wrong or may be other party iis wrong or may be both are right. we could create a win-win situation for both parties so that they sell to their domestic auidences. Talking is better than war. And i am talking about lowering one defences and cuaght off guard. Obama is naive and inexperienced. He was only elected to the Senate last year. I don't think he ever went to college, if he did, it was probably through affirmative action. Americans are never going to elect a black Muslim as President! And his wife is unfit to be first lady. She should go home and stop talking right away! Hillary Clinton has more strength and experience of any candidate. She's been a senator for 15 years now. She made many important decisions as first lady and is personally responsible for much of America's prosperity in the 90's. Most Americans have always liked her. She's just like the girl next door. You must be on some kind of hallucinogen. Hat's off to Rick in Burlington for his thoughtful insight into recent history. I could name a dozen newspapers that would be better if he would write a weekly column. Much better to add light than heat – like the Hillary fan from NY – Obama is not Muslim. Always enjoy reading those with concrete opinions – all mixed up and permanently set. Mr. Obama doesn't know the rules of politics yet (He is too young!). Keep in mind, you are not allowed to the solve problems by negotiating or talking with other leaders since they either have to say "yes sir" for everything or they are "Evil Dictators". I am afraid that's why, you are not going to win even though I support you. The question is not whether to talk to Iranian leader not. The question is whether we should guarantee to talk to them NO MATTER WHAT CONDITIONS are and talk to them within the first year in the office. If Iran tells us "we now have nuclear mass destruction weapons. If you don't do what we want you to do in the first year of your presidency we will destroy America!” Do you want to comply with them?!! It is in these kinds of scenario, Obama looked very naive by promising to talk to enemies with no condition whatsoever in the first year of his presidency. I am an independent but Clinton's answer makes me feel secure and save as an American. Obama president is very scary. We had our chances in the past to be less entangled in the entire region such as when President Carter tried to establish automotive standards that would have led to us being freed from the need for Mid-East oil by now. Unfortunately Ronald Reagan abandoned these efforts to appease the short term greed of the oil and car industries. Instead we haved to deal with clowns like Ahmadinejad and worse yet, foolishly involve ourselves in a tragic and moronic "war" that once more benefits–you guessed it–no one but the corporations profiting from the needless deaths and maimings of others. But we might as well let this guy speak his piece because–as an earlier poster pointed out–our government may decide he's our new "best friend" and start sending him weapons in a few months if we think he's on board with whatever "agenda" we pull out of the hat at that time. does everyone forget that the president of Iran was right in the middle of taking our people by force and humiliating the US and the people they held hostage back in the 70's. This man is bad! he should be treated as such, theres no rational conversation with this man. if everyone doesn't think his stupid speech about nothing to skate around the questions asked of him doesn't remind you of hitler, then somethings really wrong .he even wears his hair like him. France is 100% correct, they may have fall out from a nuclear weapon that this man may use on Isreal if he gets one. it woulkd be like mexico facing missles at us. The ONLY reason people seem to have for not talking to these evil leaders is because "it won't work". Talk about looking at the world the wrong way. Who cares if it ends up not working? There's a chance something may come from it... at the very least- international support via the idea that America is no longer a stubborn, hard-headed leader- I.e. International respect for being willing to LISTEN even if we aren't willing to compromise. I can see now from abroad, that the US population is manipulated by the media. It is sad to see that the average population does not go out of the country and see what is really happening abroad. Mr Obama is a good candidate and i agree with speaking with friends and "ennemies" if there is. But you cannot say that you would strike Pakistan if Talebans hide their, in that case bomb yourself or the UK and Canada because there are strong cells there as the former CIA head confirmed. From the outside world . We see that a country pronoing democracy has a hard time getting rid of a segregational justice and education. Healthcare is discrimative, so maybe we should the UN do their job. If you buy into this then you can't possibly have been watching for the last 6.5 years. This is the GEORGE W. BUSH administration calling Obama intellectually lazy. And the Clinton brigade is slurping it up like drooling dogs. A different point of view is not intellectually lazy. It is the opposite, a thoughtful change in the way we do things. I guess the "sharp-minded" among us always stay the course. It shows we have taken 5-10 polls on the political wind, and spent at least 5-10 minutes thinking about our approach. Instead of negotiating with our enemies , we should be working with our allies to bolster stability to that region, while sending a strong message to Iran and Syria, that Iraq will NOT become a satellite state of terrorism. We need to also hold accountable those senators who communicate defeatism to the nation, while emboldening our enemies resolve to stay the course. Saudi Arabia, Jordan, Kuwait, Turkey, and Bahrain have more to lose if we were to leave that region into the hands of Iran and Syria. They would have a terrorist state with a direct line for military logistics from Iran right in their back yard. There are a lot better avenues to take than to negotiate with our enemies who are arming and training the insurgents, who are killing our military men and women. The comments by Obama are typical from a person with very limited military, command and control, and intelligence community experience. For the nine millionth time, Sen. Clinton did NOT say that she wouldn't meet with Ahmadinejad. She said she wouldn't PROMISE to meet with him in the FIRST YEAR OF HER PRESIDENCY without ascertaining that he was serious about negotiations and not just out to grandstand. She DID say that she would send high-level envoys to ensure that this was the case. After his speech at Columbia, I must say I agree with her precautions, which are also just standard diplomatic preparations and practice. Why would she waste her time as president and risk the nation's prestige to hear the man give her a head-count of gays in Iran? This is not about showing what an open-minded, great guy you are: it's about doing the nation's business. And Obama never promised to meet leaders of rogue nations in his first year...he said he "would be willing"...meanining he would at least consider it. I love you you people just followed Hillary's lead and are now claiming Obama "promised" to meet Ahmadinejad.